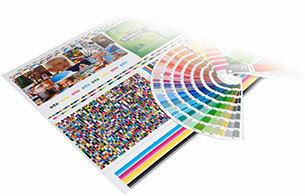 Printers increasingly recommend PPC to brand owners for the streamlining of pre-press processes. What could be better than being acknowledged for your added value by experts of the graphical market? If printing companies are convinced of our abilities, it says something about PPC. If printing companies know what to expect from us and have faith in our expertise, it carries weight. PPC is incredibly proud to be recommended as partner by a host of international and prominent printing companies. Those printing companies trust us to give their clients a predictable end result. Such trust is born and grows by trial and error. Together with our printing partners we find the best ways of realising that. This may be by installing remote proofing at the brand owners, or by installing online monitoring software, enabling clients to check and follow up the entire production process. However, positive experiences with our press sign-offs also contribute to a relationship of trust with international printing groups: when our press profiling leads to press sign-offs being reduced to a minimum both in terms of time and waste and the brand owners are satisfied, printing companies are happy to link up with PPC. This creates a stable triangular relationship based on trust and security. Printing companies become partners and rely on the report files submitted by PPC; brand owners rely on our expertise to do the press sign-off. Together we deliver the predictable quality expected by brand owners.